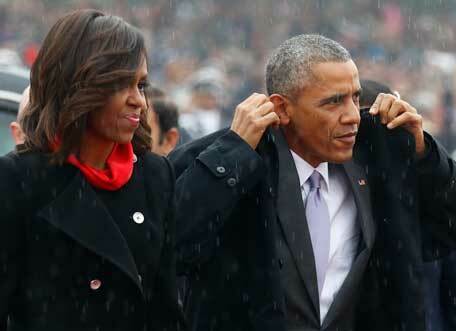 Closet diplomacy: India's PM Modi outshines Michelle Obama? 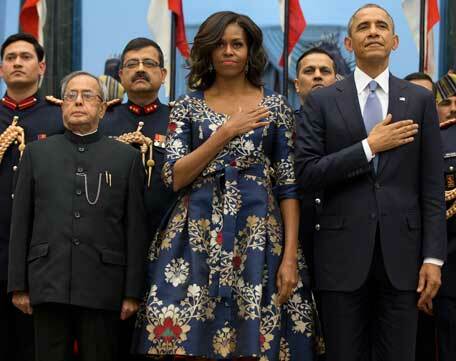 When US President Barack Obama and his wife, Michelle Obama, arrived in New Delhi on Sunday there were many serious diplomatic issues to be resolved between the two nations. 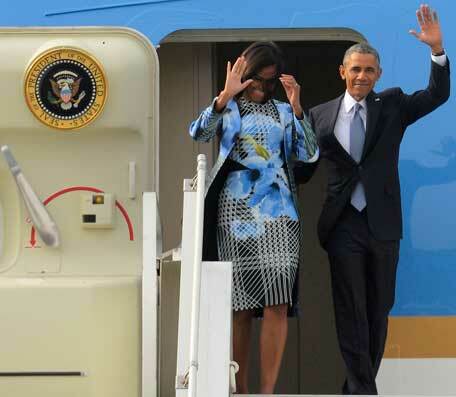 But as soon as the first lady stepped out of AirForce One all heads turned to her outfit. Michelle Obama wore a knee-length floral dress with a matching blue coat and black pumps designed by an Indian designer named Bibhu Mohapatra. Well, the bear-hug between Obama and Modi was also a talking point. But it couldn't sustain for long. What took over the social media and captured the attention of Indian media was their own PM's wardrobe. Can the first lady take the back seat here please? Everyone had a field day reporting about what Modi wore throughout the day. 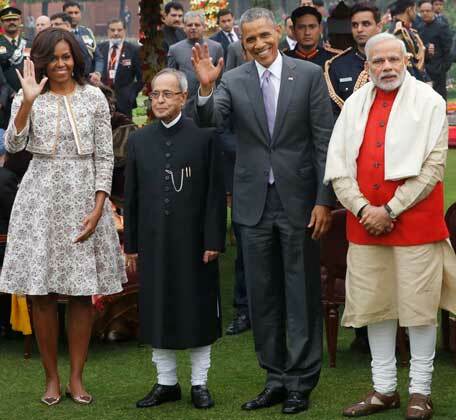 NDTV.com, based in India, went as far as saying that the Prime Minister was better dressed than the first lady! For them boring Michelle Obama, who did not make a public appearance through the day (Sunday) didn't make the cut in the evening wearing a similar floral dress. But PM Narendra Modi made three outfit changes throughout the day - and all matched his stature (it seems). 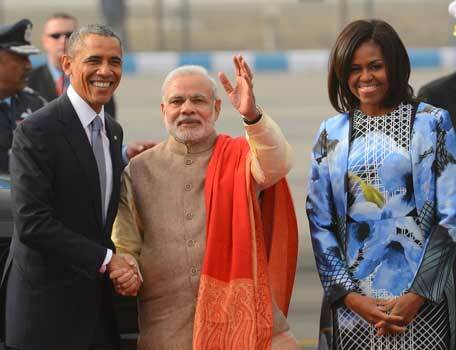 When Obama landed in the morning Modi wore a kurta-pyjama (Indian shirt-pant), a Nehru vest, and a bright red stole. When President Obama arrived at Rashtrapati Bhawan (President's Palace) for the ceremonial welcome that includes a 21-gun salute, the PM received him wearing a pinstripe 'bandhgala' suit. This was his second outfit of the day and as mentioned before, the Indian media loved it. 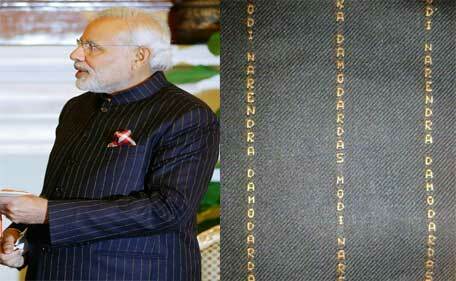 Indian Prime Minister, Narendra Damodardas Modi's haute couture was up for discussion and mocking too. He wore a suit with his own name printed all over it again and again - Michelle Obama really failed to match him. When images of the prime minister were enlarged, it became clear that the subtle stripes were made up of the words 'Narendra Damodardas Modi' printed in tiny letters on the tailored wool suit. Close-up images of the suit have since gone viral, triggering sardonic responses from social media users under the hashtag #ModiSuit. "Maybe he was afraid that someone would steal his clothes?" 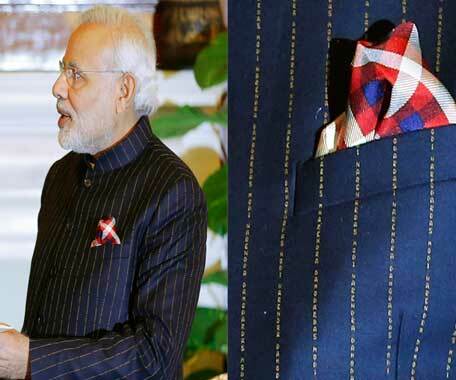 Suprateek Chatterjee tweeted, calling it a "vanity-striped suit". Tehmina was blunt, "Somewhere, narcissism just took its own life." In the evening, Modi made his final change when he attended a banquet hosted for the Obamas by President Pranab Mukherjee. He chose to wear a grey 'bandhgala' suit this time. Bright saffron-tinted orange outfits and Nehru jackets also seem PM Modi's personal favourite. 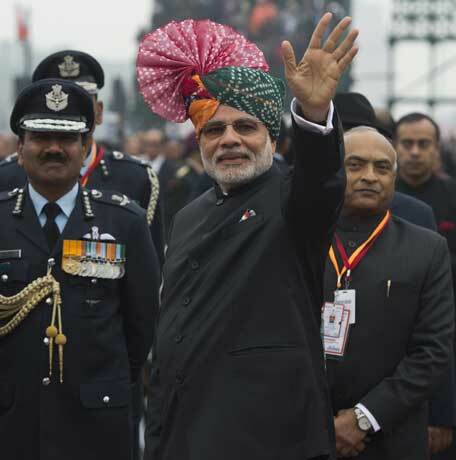 At the Republic Day celebrations on Monday Modi adorned a bright eye-catching Rajasthani bandhani turban. 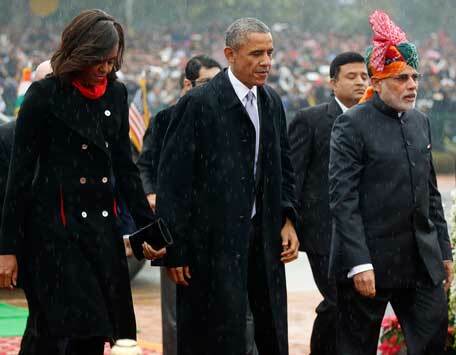 Modi was attired in traditional 'bandhgala' while President Obama in dark suits, was helped by aides into an overcoat on a cold and rainy morning. What did Michelle wear? She arrived wearing a buttoned long black coat with a red scarf tucked-in. 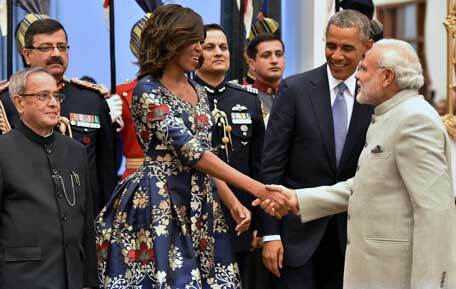 But Modi has an admirer in Obama who praised Indian PM's fashion sense, comparing it to his wife's elegance. Michelle Obama maybe some other time, some other place; till then let Indian media think it's advantage Modi.